An elite group of extraordinary whiskeys, brandies, white spirits and liqueurs. In the fourteen issues of Wine Enthusiast Magazine in 2005, I evaluated and rated approximately 280 distilled spirits, or roughly 20 per Spirits Buying Guide edition. The majority fall into the AVERAGE (80-84) and VERY GOOD (85-89)/RECOMMENDED rating categories. Though a higher than normal number were scored this year as SUPERB (90-95)/HIGHLY RECOMMENDED, relatively few spirits rose to the top rank, CLASSIC (96-100)/HIGHEST RECOMMENDATION. Virtually all of the spirits rated as CLASSIC have landed on this shortlist. That's how it should be. The very best should always be in short supply and, therefore, should always be viewed as the benchmarks of their particular category. In my formal evaluations that are conducted twelve months of the year under ideal assessment conditions, product price and source are never part of the equation with regard to the sensory reviews and ratings. When a product is bestowed "Best Buy" status, for example, that development related to price/value ratio comes about only after the formal evaluation of the product's quality is completed. The integrity of the sensory reviews is paramount and, in my estimation, should always be conducted outside the boundaries and expectations imposed by the bottle price. Since this roster of sensational spirits is released within the span of the various winter holidays, consider it as my personal gift to each of you. Likewise think of The Top 50 Spirits as the ultimate holiday gift list for those friends and family members who relish the fiery warmth of brandy, whiskey, white spirits or liqueurs during the time of year when the days are brief and cold and the nights are long, deep and blustery. For me, it's now time to begin the process all over again for 2006 and the February edition. Hey, some poor soul has to do it. May as well be moi. Cognac Toulouse-Lautrec X.O. Grande Champagne Cognac (France; C.C. Spirits, Lakeville, MA); 40% abv, $85. Smells of light caramel, candied walnuts, baked apple, honey and vanilla. The palate entry is medium-weight, sweet, honeyed and a touch buttery; the midpalate stage is round, sweet like dried red fruit, and pleasantly oaky. Ends up clean, toffee-like and smooth. Hine Triomphe Grande Champagne Cognac (France; Todhunter Imports, Inc., West Palm Beach, FL); 40% abv, $200. A lovely opening bouquet of tropical fruit; following further aeration, the bouquet becomes deeper as the oak enters the equation along with honey and beeswax. The palate entry is sweet with overtones of marzipan and light caramel; at midpalate the taste profile highlights the oaky vanilla and honey elements. Concludes gracefully, integrated and semisweet. Chabot Armagnac Vintage 1944 (France; Five Star Importers, Plainview, NY); 40% abv, $870. Initial sniffings discover earthy/woodsy scents of maple syrup, pine nuts and forest floor; aeration reveals traces of hard cheese (rancio), oak resin, butter, grapes and sautéed almonds. Palate entry is rich, sweet and caramel-like; at midpalate the sweetness narrows, allowing bittersweet cocoa, oloroso Sherry, grapes and dark caramel to enter the mix. Finishes cocoa-like and plummy. Château de Laubade 1945 Bas Armagnac (France; Baron François, New York, NY); 40% abv, $400. The bouquet offers scents of thyme, tarmac and pepper. The palate entry is luscious and bittersweet; the midpalate stage is chock full of nougat, honey and dark chocolate tastes. Concludes sweet, medium-bodied, sherried and honeyed. A true pleasure. Château du Tariquet 1982 Bas Armagnac (France; various U.S. importers); 47% abv, $80. The bouquet has scents of old leather, mince pie, prunes, meringue as well as mesmerizing odors of baked peach cobbler, melting beeswax, and vanilla cake frosting. The palate entry is full-bodied, maple-like, and sweet; traces of gum, confectioners' sugar, and honey are added at midpalate. Concludes balanced and gently sweet. Impeccably elegant. Busnel Hors d'Age 12-Years-Old Pays d'Auge Calvados (France; Pernod Ricard USA, White Plains, NY); 40% abv, $50. Opening nosings offer concentrated oak, paraffin/melted candle and baked apple; bouquet expands incrementally as raisiny/pruny/dried red fruit and cocoa override the wood and wax aromas. Palate entry is long, properly oily and full-bodied; the flavor profile turns raisiny, chocolaty and coffee-like, with just a hint of seared pork sausage. Finishes long, fat, buttery and fruity. Alexander Platinum Aqua di Vita Grappa (Italy; Palm Bay Imports, Boca Raton, FL); 60% abv, $47. Aroma at the pour is concentrated and grapy; following aeration the bouquet turns intensely pumice-like yet clean and fresh. Palate entry is pleasingly spirity, grapy and acidic; at midpalate the ripeness of the pumice emerges as the taste turns sweeter and marshmallow or cotton candy-like. Finishes cleanly, sweet and grapy. Bortolo Nardini Mandorla Almond Flavored Grappa (Italy; Winebow, New York, NY); 50% abv, $50/Liter. First whiffs pick up scents of almonds, marshmallows and honey; later sniffings detect aromas that accent and isolate the almond element. Palate entry is medium-bodied in weight and moderately sweet, nutty and toasty in taste; at midpalate a moderately fiery flash of spirit makes an impression. Ends up zesty, nutty, mildly sweet and clean. Villa Zarri Acquavitae di Vino Trebbiano dei Collio Tosco-Romagnoli 10-Year-Old Italian Brandy (Italy; Wine Wave, Inc., Jericho, NY); 44% abv, $80. An extra aged Trebbiano brandy. Opening scents are of tobacco leaf, walnut butter and oak; later sniffings find new aromas of ginger, cinnamon and pipe tobacco. Palate entry is oily, buttery and semisweet; at midpalate the taste stays the course of oil/butter, adding delicious notes of vanilla and an early-budding rancio/blue cheese quality. Finishes classy, spirity warm, woody and elegant. Cardenal Mendoza Sanchez Romate Solera Gran Reserva Brandy de Jerez (Spain; Shaw-Ross International Importers, Miramar, FL); 40% abv, $43. A delightful and massive bouquet of ripe grapes and fruit-topped cheesecake with deep-seated aromas of prunes, dates, figs, coffee beans and chocolate-covered cherries. The palate entry is long, sweet, cocoa-like and rich; at midpalate subtle bittersweet hints of citrus, black coffee and caramel emerge. Finishes virile, sweet and concentrated. Barsol Pisco Traditional Peruvian Italia Grape Brandy (Peru; Master Merchant LLC, Miami, FL); 40% abv, $20. A bouquet of banana, guava and papaya, with a slight dash of sweet herbs. The palate entry is sweet, ripe and silky; at midpalate the tastes of ripe grapes and yellow watermelon are exhilarating. Concludes on a semisweet, fruity/acidic/melony note. Very elegant. the taste buds. Ends up maple-like, with a backnote of white chocolate. The finest Cragganmore I've ever tasted. Glenmorangie Tain L'Hermitage Wood Finish Northern Highlands Single Malt Whisky (Scotland; Brown-Forman Spirits America, Louisville, KY); 46% abv, $200. Limited availability. The nosing passes find aromas of hard wood and worn leather with succulent notes of oak resin, nut loaf, light toffee and citrus. The palate entry is focused, winey and lusciously sweet; midpalate adds bittersweet flavors of caramel, nougat, candy bar and sap. Concludes elegantly, sweet, integrated and tight. Springbank 32-Year-Old Campbeltown Single Malt Whisky (Scotland; Preiss Imports, Ramona, CA); 46% abv, $750. Sweet oak, sawdust, linseed oil aromas upfront; following further aeration resiny/oaky, leathery/cowhide-like aromas mesh perfectly. The palate entry is balanced, semisweet, lean and outdoorsy; at midpalate the flavor profile suggests tastes of pork sausage, bacon fat, almond oil, suet and malted barley. Finishes clean, balanced and a touch warm on the tongue. The Balvenie Thirty Speyside Single Malt Whisky (Scotland; William Grant & Sons, New York, NY); 47.3% abv, $499. Bouquet offers hints of mead, almonds, pencil eraser, coffee grounds, pork and old leather. Palate entry is intensely resiny, smoldering warm and waxy; at midpalate, taste explosions of honey, oloroso Sherry, dark caramel, hard cheese, malted milk and Christmas pudding treat the taste buds to an extraordinary library of flavors. Ends deliciously sweet and honeyed. The best Balvenie I've ever reviewed. Arran Single Sherry Cask/Cask Strength Isle of Arran Single Malt Whisky (Scotland; Artisanal Distillates, Prairie Village, KS); 57.3% abv, $79. First nosing seems green and vegetal, with a background trace of sea salt; further time stirs additional scents, including wet sand, green olives and linseed oil. Palate entry is lightly honeyed and caramel-like; by midpalate, the Sherry influence is in full bloom as succulent flavors of dark caramel, black tea leaves, nougat, treacle and marzipan thrill the palate. Finishes sweet, plucky and heady. Glen Garioch 1958 46-Year-Old Natural Cask Strength Eastern Highlands Single Malt Whisky (Scotland; White Rock Distilleries, Lewiston, ME); 43% abv, $2,600. Only 43 bottles for the U.S. Spearmint, shale, wet cement, light toffee, gum, white pears, cigarette ash, bay leaves and pineapple in the nose. Palate entry is earthy-floral, herbal, and dry to off-dry; at midpalate the taste profile shows flavors of dry malt cereal, oak, vanilla bean cocoa bean, and nougat. Ends up off-dry to bittersweet, balanced, intensely cereally. Glenfarclas 105 Speyside Single Malt Whisky (Scotland; Sazerac Company, New Orleans, LA); Cask Strength 60% abv, $75. The alluring opening aroma offers scents of plum pudding, mince pie and dark caramel; aeration reveals notes of roasted chestnut, beeswax, pork sausages, old saddle leather and vanilla wafer. The entry is prickly, but sweet and sappy; at midpalate large flavors of dark caramel, oloroso Sherry, vanilla cream and dark chocolate are added. Concludes with deep flavors of sweet oak, toffee and butter cream. Luscious. Lombard Bunnahabhain 1979 Islay Single Malt Whisky (Scotland; MHW Ltd. Manhasset, NY); 50% abv, $170. First aromas are deep and woody; after six minutes of additional aeration seductive notes of sautéed butter, roasted asparagus and scorched vegetation emerge. Palate entry is focused, meaty and mildly salty/briny; at midpalate flavors of buttered walnut, nougat and fudge contribute to an engaging mouth experience. Concludes moderately salty/seaweedy and toasty. The Dalmore 21-Year-Old Northern Highlands Single Malt Whisky (Scotland; Fielding & Jones, Ltd., Deerfield, IL); 43% abv, $70. A superb and complex bouquet with aromas of old leather, palm oil and cigar tobacco with deeper layers of spice, caraway seed, black pepper, dry malt and oak. The palate entry is buttery, medium-bodied and stunningly toffee-like; at midpalate the flavor goes mildly citrusy, creamy and bittersweet. Finishes with flavors of barley and maple. The Glenlivet 15-Year-Old French Oak Reserve Speyside Single Malt Whisky (Scotland; Pernod Ricard USA, White Plains, NY); 40% abv, $50. First whiffs pick up scents of fresh pineapple, cedar and paraffin; later sniffings detect subtle notes of baked pear and sweet oak. Palate entry features a firm, moderately oily and velvety texture; by midpalate, integrated flavors of ripe peach, pear drops and bran delight the taste buds. Finish is extended, semisweet and coconut-like. Replaces the 12-year-old French Oak Finish. Booker's 7-Year, 11-Month Kentucky Straight Bourbon Whiskey Batch No. B96-L-23 (USA; Jim Beam Brands, Deerfield, IL); 63.4% abv, $50. A first-rate, multilayered bouquet that includes notes of cocoa, cigar tobacco and paraffin with aromas of caramel corn, cotton candy, oak and tapioca. The palate entry features tastes of spice, buttered corn, bacon fat and cream; the midpalate displays traces of butterscotch, nougat, sap, maple and vanilla. Finishes spirity and biscuity. Add water to reduce the alcohol. Evan Williams Vintage 1995 Single Barrel Kentucky Straight Bourbon Whiskey (USA; Heaven Hill Distilleries, Bardstown, KY); 43.3% abv, $25. The layered aroma is loaded with savory scents, including pine nuts, acorn, firm spirit core and oak; a sophisticated, lean and muscular bouquet. Palate entry is slightly sweet and even a touch spicy; the midpalate stage is tight, fat-free, yet supple, grainy and direct. Concludes moderately sweet and delicious. This sinewy, crisp-as-parchment Bourbon ranks with the best of the Vintage series. Michter's 10-Year-Old Straight Rye Whiskey (USA; Michter's American Whiskey Company, Bardstown, KY); 46.4% abv, $70. The first aromas are strong, nutty and mocha-like; further sniffings pick up deep-seeded scents of walnut, new leather, flax-fiber and soft cheese. The sweet and honeyed flavor profile bursts onto the tongue in the entry stage, then turns drier, grape seed-like and woodier at midpalate. Ends up incredibly honeyed. A tour-de-force rye whiskey that delivers at every level. Pappy Van Winkle's Family Reserve 15-Year-Old Kentucky Straight Bourbon Whiskey (USA; Old Rip Van Winkle Distillery, Frankfort, KY); 53.5% abv, $45. Initial sniffings find aromas of sweet corn dripping with butter, dark toffee and hazelnuts; later inhalations pick up notes of chocolate cake frosting, cocoa beans and vanilla. Palate entry is spicy, prickly and raisiny; at midpalate the taste features lead pencil, slate, black pepper, sautéed butter and deep-seared oak. Finishes ash-like, chewy and oily. American whiskey doesn't come any finer. Bernheim Original Kentucky Straight Wheat Whiskey (USA; Heaven Hill Distilleries, Inc., Bardstown, KY); 45% abv, $40. Initial scents are floral and wheat cracker-like; aeration adds deeper, mildly sweet aromas of sap, fresh vanilla bean and light honey. Palate entry is finely balanced with wood, moderately sweet grain and acidity; by midpalate the alcohol warms the throat with off-dry flavors of charred oak, light toffee and sap. Finishes elegant and warm. A true sipping whiskey. Buffalo Trace Kentucky Straight Bourbon Whiskey (USA; Buffalo Trace Distillery, Frankfort, KY); 45% abv, $20. Initial aroma displays elements of spice, sautéed butter and old leather gloves; following aeration the fat/butter component dominates. Palate entry is corny sweet and almost fruity; at midpalate tastes include sweet oak, cinnamon, nutmeg, honey, tar and beeswax. Concludes spirity and feisty. One of the greatest values in the worldwide whiskey category. Old Pogue "Master's Select" Kentucky Straight Bourbon Whiskey (USA; The Old Pogue Distillery, Campbellsville, KY); 45.5% abv, $40. The nosing passes find alluring, sweet grain and plum scents, delicate aromas of paraffin, confectioner's sugar and a trace of maple. Palate entry is silky smooth and tastes of light caramel, buttered sweet corn and maple. Concludes firm, warm on the tongue, and moderately oily. A new American small-batch gem. Wild Turkey Russell's Reserve 10-Year-Old Kentucky Straight Bourbon Whiskey (USA; Austin Nichols Distilling Co., Lawrenceburg, KY); 45% abv, $30. The bouquet features a woody/piney aromatic surface with dry scents of grain and resin beneath. The palate entry has a flash of corny sweetness upfront, then a whisper of butterscotch; the midpalate is full-bodied, sweet, oily, clean and maple-like. Concludes with sumptuous tastes of dark honey and marzipan. La Favorite Rhum Agricole Vieux (Martinique; Caribbean Spirits, Inc., Chicago, IL); 40% abv, $48/Liter. The nose offers scents of oaky vanilla, rum cake, holiday fruitcake, black pepper, cigar tobacco and nutmeg. The palate entry is sweet and moderately oily; the midpalate boasts flavors of butter cream, dark chocolate, cream sherry, cola, citrus, and honey. Ends on an opulent sweet caramel-like note. Dark, oak-aged rum at its finest. Neisson Rhum Agricole Blanc (Martinique; Caribbean Spirits, Inc., Chicago, IL); 50% abv, $30/Liter. The opening aroma is marvelously beany and grassy; later, sweetish flavors of dark caramel, chimney soot, and dark, old honey make scrumptious inhaling. The palate entry is honeyed, warm, and cocoa-like; at midpalate the grassy/weedy/cane-like taste balances the honeyed sweetness. Concludes cocoa-like, intense yet smooth, and memorably sweet. 10 Cane Rum (Trinidad; Moet Hennessy USA, New York, NY); 40% abv, $35. A one-of-a-kind bouquet that includes aromas of cooked brown rice and broccoli, brown sugar, raw cane, brine, soy sauce and vanilla bean. The palate entry tastes of bittersweet sugar cane; at midpalate the taste becomes more sophisticated, silky, honey sweet and lightly spiced. Concludes nicely bittersweet, a bit cocoa-like and beany. Mount Gay Extra Old Barbados Rum (Barbados; Remy Amerique, New York, NY); 40% abv, $30. Mount Gay Extra Old Barbados Rum (Barbados; Remy Amerique, New York, NY); 40% abv, $30. The initial aroma includes scents of treacle, spice and flower garden; further aeration brings out aromas of black pepper, cola nut, dried red fruit, and molasses. The palate entry is long and toffee-like; at midpalate honeyed, apple butter-like, and creamy flavors add zesty spice to the aftertaste. Rhum Clément V.S.O.P. Aged Rum (Martinique/France; Clement USA, Brooklyn, NY); 40% abv, $30. A muted aroma of brown sugar and milk chocolate with traces of peanut and black pepper. The elegant yet assertive palate entry is firm, peppery, moderately sweet and cane-like; at midpalate the texture turns silky, semisweet and cocoa-like to the taste, and eminently elegant and sophisticated in style. Finishes sweet, honeyed, medium-bodied, svelte and utterly yummy. Milagro Select Barrel Reserve Reposado 100% Agave Tequila NOM-1420-CRT (Mexico; William Grant & Sons, New York, NY); 40% abv, $70. Initial aroma of wax paper and black pepper; aeration stimulates scents of asparagus, broccoli, new leather and herbal butter. The palate entry is spicy and semisweet; the midpalate adds subtle tastes of butter, steamed green vegetables, white rice and light toffee. Finishes satiny smooth and appealingly spicy. A tour de force in balance and harmony. Tequila Tezon Reposado 100% Agave Tequila (Mexico; Pernod Ricard USA, White Plains, NY); 40% abv, $65. The initial aroma is spiced and intensely peppery; evidence of dill and olive brine comes to the surface in the later sniffings. The palate entry is smooth, creamy and a touch vanilla-like; the midpalate stage finds tastes of black pepper, roasted agave, new leather and pickling brine. Concludes satiny in texture, slightly smoky and sweet. Scorpion Mezcal Anejo 5 Years Old (Mexico; Caballeros, Inc,/MHW, Manhasset, NY); 40% abv, $180. The first nosings find notes of quinine, burnt match and furniture polish; additional time brings out deeper scents of onion, brine, olives and damp earth. The palate entry is sooty, sweet and close to creamy; at midpalate the taste profile turns zesty and peppery, oaky sweet, charcoal-like and savory. Finishes bittersweet and caramel-like. Skyy 90 Vodka (USA; SKYY Spirits, San Francisco, CA); 45% abv, $35. An irresistible powerhouse of a vodka bouquet, assertive, concentrated, dry and grainy. The palate entry has plenty of grainy/spirity giddy-up with a note of sweetness; at midpalate the spirit warmth fades, leaving behind the biscuity/ wheat cracker taste of the grain and a velvety texture. Ends up as assertively as it began. Stolichnaya elit Vodka (Russia; Allied Domecq Spirits, USA, Westport, CT); 40% abv, $60. Aroma is dry, clean, and grainy, with background notes of parchment and lychee; later passes offer semisweet, mildly smoky/ashy scents of charcoal and smoldering embers. Palate entry is firm, moderately oily, bittersweet; at midpalate concentrated and spicy grain flavors mingle adroitly with the smoky, sap- and resin-sweet birch-charcoal filtering influence. Concludes sweetly and almost candy-like. Xellent Swiss Vodka (Switzerland; The Spirit of Hartford, Avon, CT); 40% abv, $34. The initial whiffs find herbal aromas with faint hints of jasmine and moss; additional scents of tea leaves, minerals and wet stone appear in the later passes. The palate entry is semisweet and biscuity; midpalate is nutty, concentrated and remarkably mineral-like. Concludes dynamically. One of only three or four over-$30 superpremium vodkas actually worth the price tag. Wow. Hangar One Fraser River Raspberry Infused Vodka (USA; Craft Distillers Portfolio, Ukiah, CA); 40% abv, $36. The bouquet offers concentrated notes of fresh-picked raspberries; with time, the bouquet takes on a densely preserves-like personality. The entry flavor is lean, astringent and fruity; at midpalate the flavor turns vinous, leafy, off-dry to bitter, just as raspberries off the vine can be. Ends on a bittersweet note. Vermont Gold 100% Maple Sap Vodka (USA; Vermont Spirits Co., St. Johnsbury, VT); 40% abv, $44. A surprising and charming bouquet of fresh sugar maple candy. The palate entry is toasty, maple sweet, and full-bodied; at midpalate the toastiness evolves to include delicious tastes of sugar maple candy, dark honey, sap, resin and malt. Finishes divinely sweet and sap-like. Worth every cent. Vincent Van Gogh Espresso Vodka (Holland; Luctor International, Reno, NV); 35% abv, $30. A wonderful espresso coffee aroma with back notes of cocoa and charred almond. The palate entry is like top-quality espresso in its bearing; at midpalate the taste profile displays ideal amounts of bitterness, pod-like genuineness and real espresso bite and elegance. Finishes with just the right balance of bitterness, beaniness and coffee jolt. Wow. Wokka Saki Vodka with Sake Added (United Kingdom; Pasternak Wine Imports, Harrison, NY; 40% abv, $40. A stunningly elegant bouquet with alluring scents of peaches and nectarines. The palate entry is sweet, ripe, oily, and textured; at midpalate the taste profile turns equally grainy and fruity, with the 80-proof alcohol serving well as a base for the nimble flavorings. Ends well in a satiny, oily manner, showing just a trace of peach/nectarine flavor. Citadelle Gin (France; W.J. Deutsch & Sons, New York, NY); 44% abv, $25. The first nosing passes find scents of fresh flowers, jasmine, honeysuckle and cardamom; further aeration stimulates deeper, more herbal notes including anise, grains of paradise, and cinnamon. At the palate entry, the off-dry juniper presence is clearly evident; at midpalate the taste profile turns creamy, rich, and flowery once again. Ends up off-dry, high on juniper essence, and elegant. 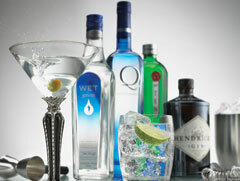 Miller's Westbourne Strength Reformed London Dry Gin (England/Iceland; Skyy Spirits, New York, NY); 45.2% abv, $35. The initial bouquet has scents of lime peel and cassia bark; aeration adds traces of juniper, angelica and coriander. The palate entry features snappy tastes of off-dry licorice and orris root flavors; at midpalate there is a mellow creaminess accented by juniper, tropical fruit and a hint of nutmeg. Finishes gracefully off-dry, textured, moderately creamy and savory. South Premium Gin (New Zealand; Pearl Beverages LLP, Denver, CO); 48.2% abv, $33. Alluring opening scent is stunningly baked and pod-like; further air contact releases aromas of moss, slate, charcoal and mint. Palate entry is bittersweet and grainy; at midpalate the juniper peeks out from the behind the luxurious curtain of wet earth, angelica, orris and green vegetation. Concludes on a sweet, juniper note and with a touch of warmth. Cointreau Liqueur (France; Remy Amerique, Inc. New York, NY); 40% abv, $32. A sophisticated orange pulp bouquet, which after aeration, turns much more dry peel-like. The palate entry is intensely orange peel-like yet more sweet than bittersweet; the midpalate stage is deeply orangey, sweet and sublimely juicy. Finishes ideally citrusy/tart/astringent, then turns lithe and sweet. The benchmark for all orange-flavored liqueurs/triple secs. State of the art. Starbucks Coffee Liqueur (USA; Fielding & Jones, Ltd. Cincinnati, OH); 20% abv, $23. Luscious aromas are of cocoa bean, cigarette tobacco and sand/gravel. The palate entry is strong yet elegant, coffee-like and bittersweet; at midpalate the bittersweet element gives way to an intense coffee bean flavor that's right on the money. Finishes bitter and genuinely coffee-like.